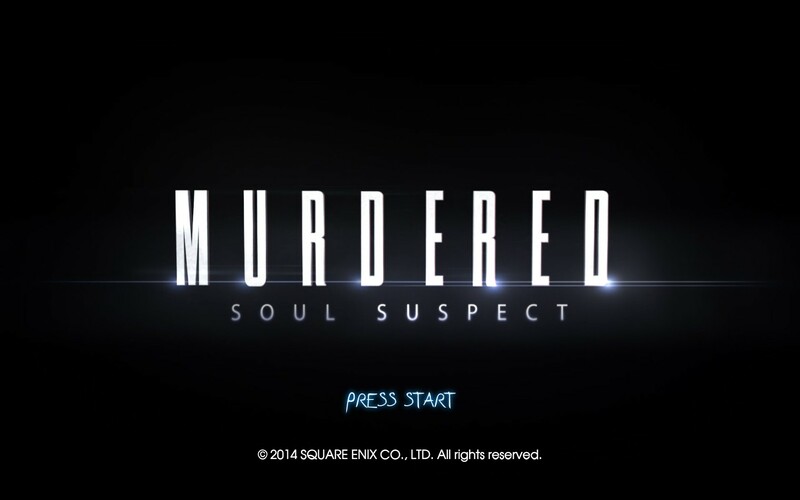 Murdered: Soul Suspect: It’s Never Easy Moving On. Ever since I had my first taste of a story first game all those years ago I’ve been hooked on finding that same experience again in modern titles. Whilst Quantic Dream has always managed to deliver a solid experience in this regard newcomers to this field are very hit or miss, often not achieving what they set out to do. The struggle between just how much game makes it into the final product is what usually trips up most first time developers with the story suffering because of it (or vice versa). Murdered: Soul Suspect treads carefully enough to avoid some of these potential pitfalls whilst unfortunately falling prey to many others. In the sleepy town of Salem, Massachusetts a murderer walks in the shadows. The killings seemingly have no relation to one another except for the victims always being young girls. 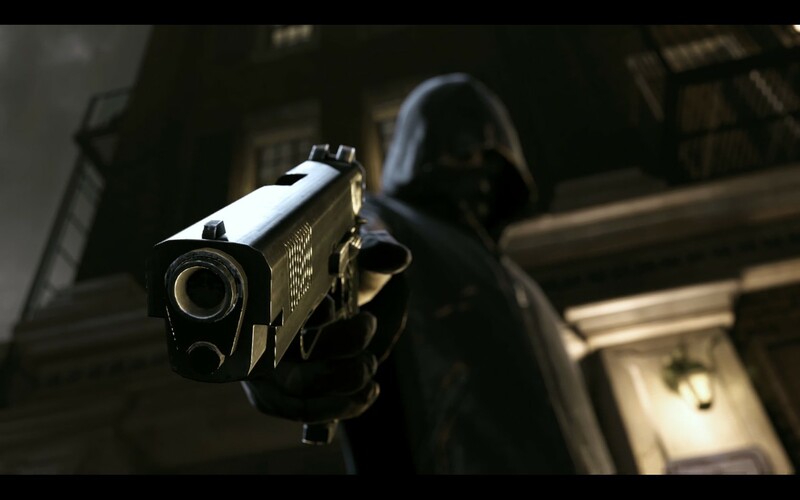 The case has become something of an obsession for one of the local officers, Ronan O’Connor, a reformed criminal looking to make up for his questionable past. When he gets word of the Bell killer’s location he disregards all calls to wait for backup and pursues the criminal himself. However things don’t go as planned and in an instant things take a dark turn with Ronan thrown out a window and his life unceremoniously ended by his own weapon. Now, as he lies trapped between this world and the next, Ronan is compelled to find out who his killer is. Visually Murdered: Soul Suspect is a dark and dreary place with the whole game taking place during the course of a single night. The graphics are about average when you compare it to similar titles of its time, a lot of the style still rooted in the previous generation’s console limitations. This might also be partly due to the use of the Unreal 3 engine which always seems to have a similar visual feel no matter the art styling. The styling of the UI elements seems to be of much poorer quality than the rest of the game, to the point of being quite distracting. I understand that at least some of this was done to enhance the “supernatural” feel of the game but since it’s not consistent throughout the various elements it just ends up sticking out more than anything. 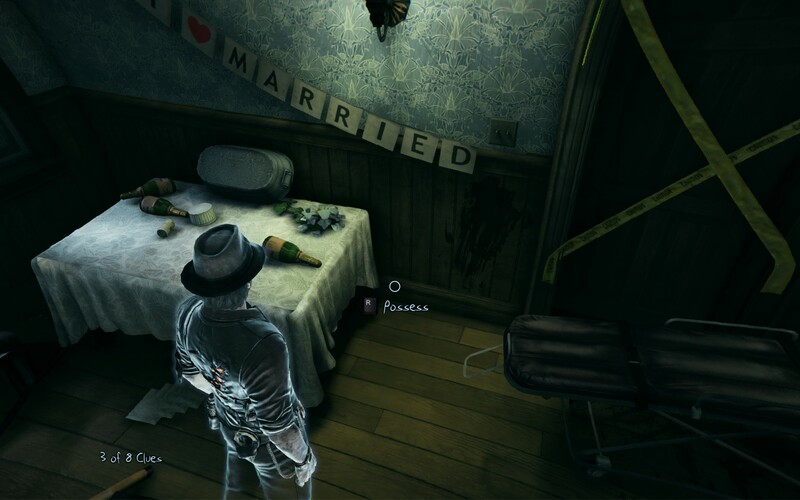 Murdered: Soul Suspect is a puzzle game, one that requires you to gather up all the clues you can find and then use them in order to piece together what happened at a particular scene. Typically the clues are just things lying around the room, waiting for you to interact with them, although some will require a little more detective work in order to unlock them. Whilst the world isn’t particularly big you are free to explore pretty much all of it at your leisure although some places will be unavailable to you until you’ve unlocked some of your ghost abilities further down the line. There’s also numerous side quests and collectible missions which unlock various other stories that aren’t related to the main campaign, something which bolsters Murdered: Soul Suspects otherwise drastically short play time. The puzzles that you’ll solve really aren’t that difficult at all considering that you’re told what area you need to look in to find them (moving out of an area where a clue might be removes the clue counter, indicating you’ve wandered too far) and that relevant clues typically come with a “memory flash” of what happened. These flashes sometimes come with another word puzzle element which has you choosing a few words to describe the picture you’re seeing. The hardest part then comes from selecting the right clues to complete the investigation or figuring out how to influence someone in order to get the clue you need. Indeed the only time I struggled to finish investigations was when the game decided not to spawn the required objects for me to interact with, something I’ll touch on later. There are open world aspects to Murdered: Soul Suspect as well, allowing you to run around Salem looking for collectibles and helping out other ghosts that find themselves trapped in this realm. You can also posses people and read their minds, which sounds fun to begin with, however after a while you start to find that many NPCs are reused throughout the game and, despite their different circumstances in which you find them, they always have the same few lines to say. I feel like there’s something of a missed opportunity here as it would’ve added a little something more to the world to be able to influence the random people on the street or if there was another story you could unlock by reading enough minds. Sadly there isn’t and so after the first hour or so you’ll likely find yourself skipping all non-essential ghost power use. 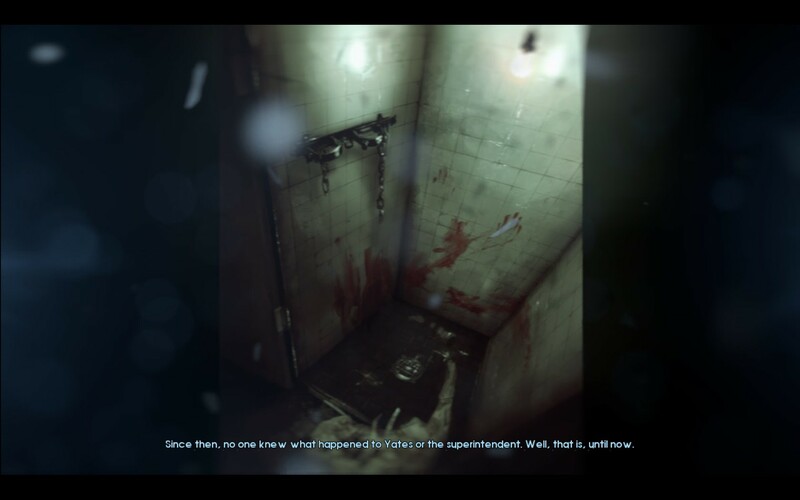 Murdered: Soul Suspect is also rather glitchy as the screenshot above will attest to. There are numerous times when NPCs just won’t spawn or will spawn but won’t be visible or in the location where the game wants them to be. You can often resolve this issue by restart from a checkpoint but other times, like during an investigation, you’ll be left wandering around in circles wondering where the last clue is or clicking on clues you’ve already discovered hoping they’ll trigger something else. For a game that struggles with pacing at the best of times this isn’t a great glitch to have and it definitely had a negative impact on my experience. However Murdered: Soul Suspect’s greatest failing is that the story just fails to captivate you in any way. On the surface the concept sounds pretty amazing, you’re a ghost detective solving your own murder, however I simply failed to empathize with the majority of the characters. There was massive potential here to give the characters incredible depth using the mind reading mechanic which unfortunately seems to be used to pad the game time out. Worst still the characters that were seemingly given the most attention, in terms of backstory development, are the ones with the least amount of presence in the actual game, being constrained to journal entries. Honestly my hopes weren’t that high for an emotional rollercoaster but I have to say that the overall story felt very lacklustre which is only amplified by the sub-par mechanics. It’s a real shame because the side stories, typically the ones you unlock from collecting a bunch of artifacts in a particular area, are actually quite good. 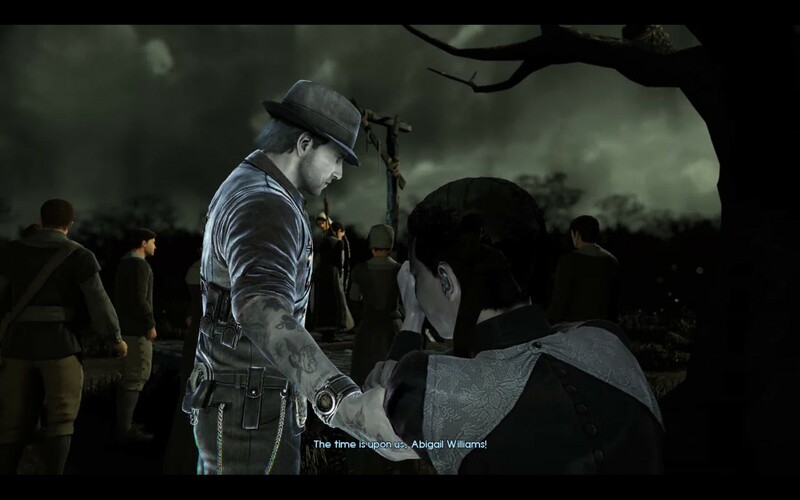 This was probably the only reason I pursued most of them down as they are the shining moments in Murdered: Soul Suspect, both in terms of their stories as well as the voice acting behind them. Again it feels like another one of the game’s missed opportunities as these stories are a part of the history of this game’s world and yet they’re limited to 5 minute reading sessions that are only unlocked through a tedious collecting mechanic. I don’t have a good idea as to how they could be worked in but suffice to say that Airtight Games would do well to replicate what they did in those stories in the main campaign. Murdered: Soul Suspect unfortunately fails to achieve the goals it set out to do, delivering a mediocre story behind trivial puzzle mechanics whilst hiding its best aspects in a tedious treasure quest. I won’t deny that I had my hand in this as when I heard about the concept I immediately started drawing comparisons to Heavy Rain in my head and there are few games, in my mind, that come close. Still even taking that into consideration Murdered: Soul Suspect feels like a decidedly average game, failing to evoke the kind of emotional investment required by a game of this nature. Murdered: Soul Suspect is available on PC, PlayStation3, PlayStation4, Xbox360 and XboxOne right now for $49.99, $79.95, $99.95, $79.95 and $99.95 respectively. Game was played entirely on the PC with 7 hours of total play time and 83% of the achievements unlocked.